The Raman Lidar (RL) is an active, ground-based laser remote sensing instrument that measures vertical profiles of water-vapor mixing ratio and several cloud- and aerosol-related quantities. 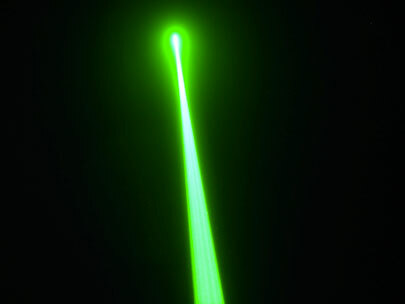 Lidar is the optical analog of radar, using pulses of laser radiation to probe the atmosphere. A standard state-of-the-art multiwavelength Raman lidar, commonly dubbed as 3 backscatter + 2 extinction, or in short 3β+2α or simply 3+2 Raman lidar uses a (seeded) Nd:YAG laser which emits light at wavelengths of 1064, 532, and 355 nm. A beam expander reduces the beam divergence. The backscattered light is collected with a telescope. A 7-channel receiver separates the elastically backscattered signals at the three laser wavelengths and the Raman signals of nitrogen at 387 and 607 nm and of water vapor at 407 nm by the use of dichroic beamsplitters and interference filters. A polarizer discriminates the parallel- and cross-polarized components of the 532-nm backscatter signal. All signals are detected by photomultiplier tubes and recorded in single-photon-counting mode. From these signals, profiles of the backscatter coefficient at the three emitted wavelengths, the depolarization ratio at 532 nm, as well as the extinction coefficient and the lidar ratio at 355 and 532 nm are determined. Furthermore, profiles of the water-vapor mixing ratio can be derived. From this quantity the relative humidity can be determined in the same scattering volume as the aerosol properties if the temperature profile is known. In most of the 3+2 systems information from nearby radio sonde launches is used. Some systems make use of the pure-rotational Raman effect that allows for measuring the temperature profile in the atmosphere without the use of radio sondes. Raman lidar systems detect, in addition to backscattering at the laser wavelength (elastic backscattering), also signals at different wavelengths. These signals emerge from scattering by molecules, which absorb a part of the photon's energy or add an amount of energy to the photon's energy (inelastic scattering). By inelastic scattering, these molecules change their vibrational and/or rotational state (Raman process). The backscattered light experiences a frequency shift caused by its change of energy. This shift is characteristic for the scattering molecule, which is schematically shown below. The Raman scattering cross sections are several orders of magnitude smaller than those for elastic scattering. 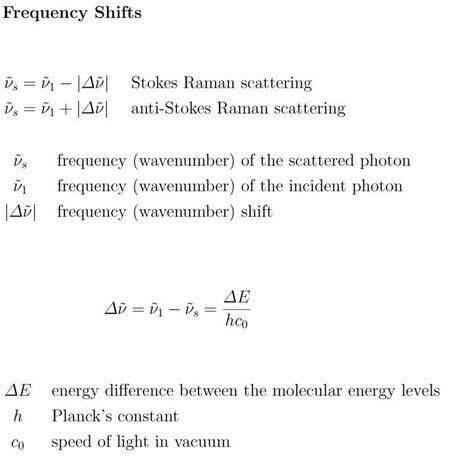 Therefore, Raman lidars work with high laser pulse energy, relatively large telescopes, and efficient detectors on the basis of single-photon detection. The following picture shows the atmospheric Raman spectrum for a stimulation wavelength of 355 nm and 532 nm, respectively. Since the population of energy levels follows a Boltzmann distribution, the intensity distribution within the Raman bands contains information on the temperature in the scattering volume. One application of Raman lidars is therefore the measurement of atmospheric temperature profiles. 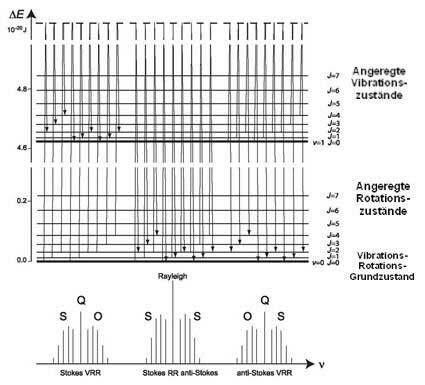 A change of the vibrational state results in frequency shifts of some hundred to thousand wave numbers (depending on the Raman active molecules). Spectrally resolved analysis of backscattered radiation therefore allows the measurement of various atmospheric species. However, the low Raman scattering cross sections limit a meaningful application to gases present in rather high concentrations. Thus Raman lidar is widely used for measurements of atmospheric water vapor.